They're low in sodium with just 125mg (5% DV) of salt. They contain at least 4 added sweeteners: carob powder, honey, non-GMO glucose, and sugar. Sweeteners improve taste and are okay in moderation. However, sweeteners also add unnecessary calories, often make you hungry, and raise your blood sugar. Are Caramel Almond & Sea Salt KIND Bars vegan-friendly? No. Caramel Almond & Sea Salt KIND Bars are not vegan-friendly because they contain honey and milk powder. Are Caramel Almond & Sea Salt KIND Bars gluten-free? Yes. Caramel Almond & Sea Salt KIND Bars are gluten-free. All 13 ingredients are gluten-free. Are Caramel Almond & Sea Salt KIND Bars dairy-free? No. Caramel Almond & Sea Salt KIND Bars are not dairy-free because they contain milk powder. Are Caramel Almond & Sea Salt KIND Bars keto friendly? No. Caramel Almond & Sea Salt KIND Bars are not keto friendly because they contain chicory root fiber, honey, sugar, non-GMO glucose, crisp rice, and carob powder. Are Caramel Almond & Sea Salt KIND Bars lactose-free? No. Caramel Almond & Sea Salt KIND Bars are not lactose-free because they contain milk powder. Are Caramel Almond & Sea Salt KIND Bars paleo? No. Caramel Almond & Sea Salt KIND Bars are not paleo because they contain palm kernel oil, sugar, non-GMO glucose, crisp rice, and soy lecithin. 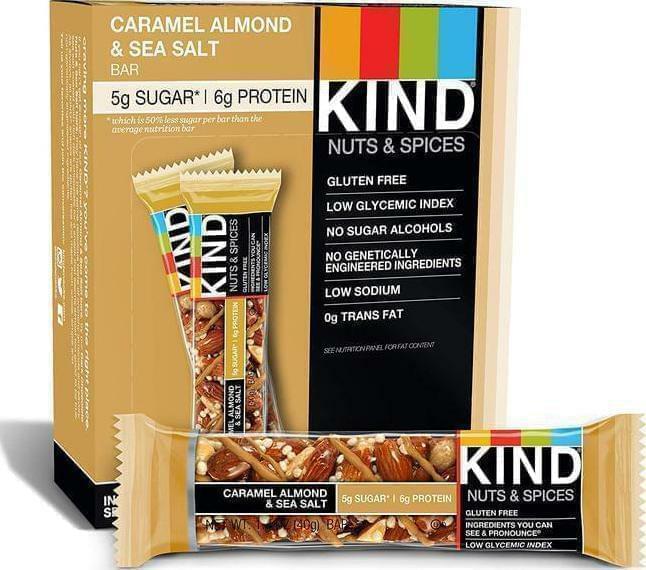 Caramel Almond & Sea Salt KIND Bars are made by KIND Snacks.